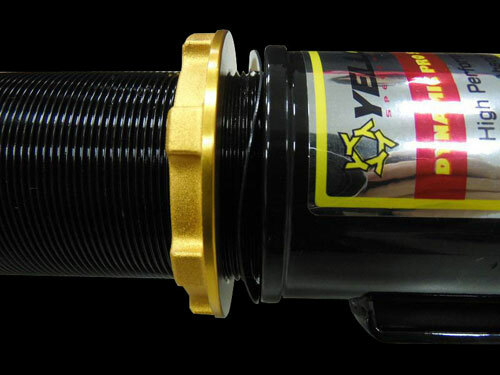 2-way or 3-way CLUB PERFORMANCE suspension system is ideal for all motoring enthusiasts wanting excellent handling when they participate in occasional track day, weekend race, club circuit or less aggressive road competition, but also desiring adjustable damping setups for daily drive without sacrificing ride comfort. With an external reservoir, this system allows for increased oil capacity to dissipate heat superiorly, which enables you to operate this product for long period and improves performance & handling. 2-WAY CLUB PERFORMANCE coilovers feature separate adjustable compression and rebound damping settings and full length ride height adjustment. 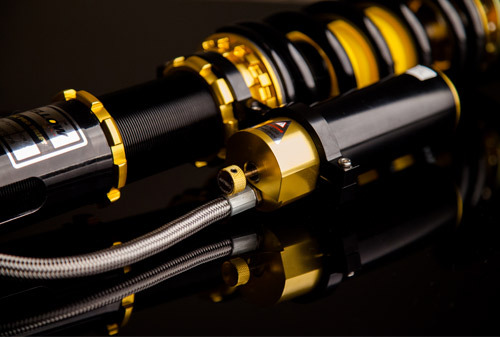 3-WAY CLUB PERFORMANCE coilovers offer independent low-speed and high-speed compression damping and separate rebound adjustment as well as full length ride height adjustment. The outstanding feature to 2-way Club Performance suspension system is external canister allowing you to adjust the rebound and compression damping separately. The canister comes with either hose or piggyback depending on application. 3-way Club Performance suspension system offers independent low-speed and high-speed compression damping adjustment. It features 50 clicks of high-speed compression, 24 clicks of low-speed compression and 33 clicks of rebound damping adjustment. 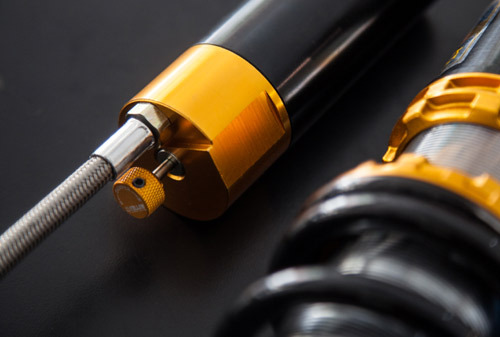 Drivers are able to fine tune the shocks to their desired dampening rates for different road conditions. The canister comes with either hose or piggyback depending on application. With an external reservoir, this system provides extra oil capacity to dissipate heat superiorly, which allows you to operate this product for long period and improves performance & handling due to more stable variations in damping rates. The canister body is made of high grade of steel or alloy aluminum material (depending on application) which can resist high gas pressure. 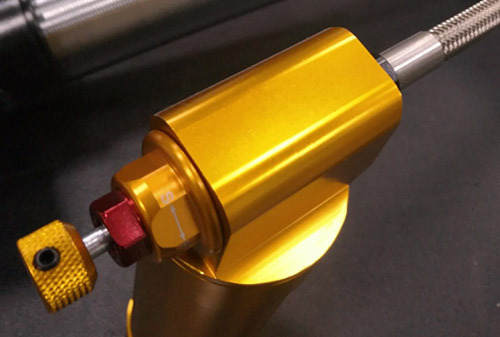 The bottom of the canister is made of 7075 aircraft quality alloy, and is processed with anodized surface treatment to prevent corrosion in the harsh conditions of motorsport. 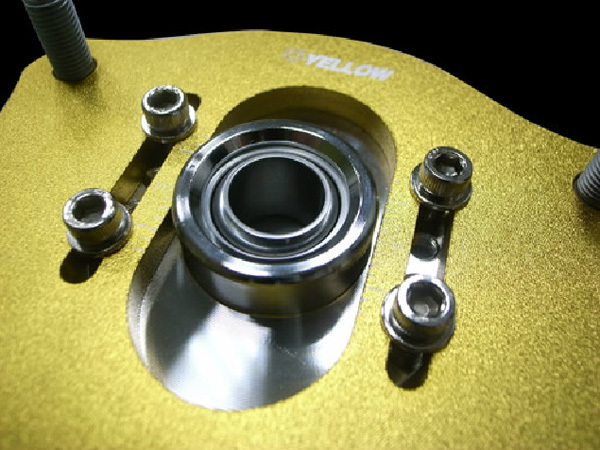 For suspension systems utilizing a MacPherson strut type, the pillow ball mounts with adjustable camber plates (P/U *) are included fronts and rears (where applicable) to offer direct and complete handling response. 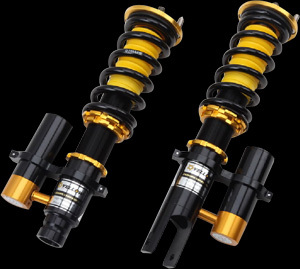 For suspension systems utilizing a Double A-Arm strut type, this coilover kit comes standard with aluminum upper mounts (A/U). 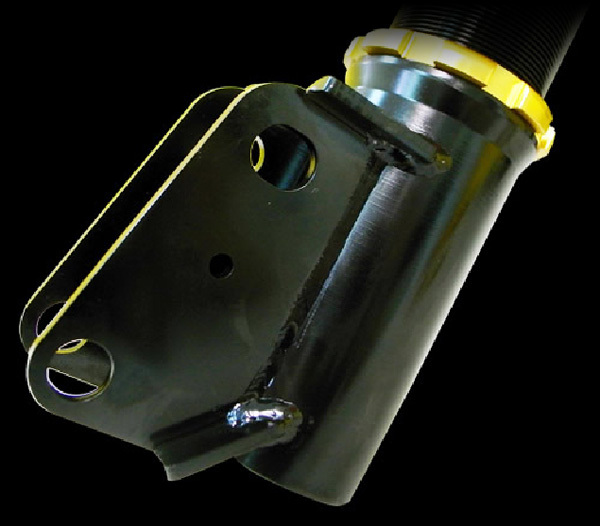 We also offer pilowball upper mounts (P/U) for Double A-Arm strut type as an upgrade for extra cost. The needle valve piston is utilized to make the steering more agile and to stabilize the vehicle. 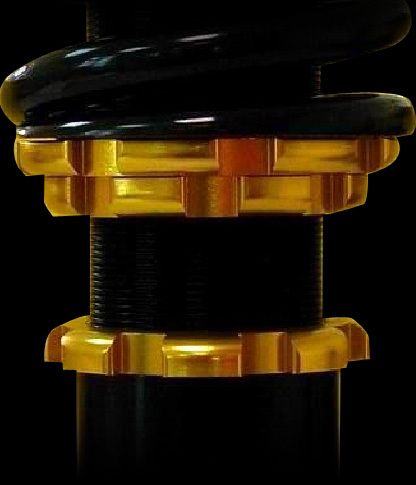 A high rigidity 52mm shock body used for MacPherson strut type for extra oil capacity enables the cushioning force to have optimal linear change. 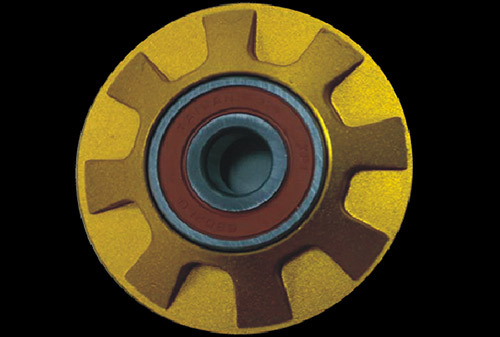 High quality oil seals are utilized to withstand high temperatures and to prevent oil from escaping. The piston rod is made from high quality S45C steel and is processed with Thermal Refining and High-frequency Induction Hardening Treatments for rigidity and durability. 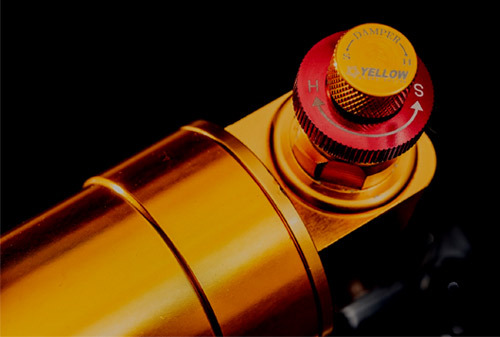 YELLOWSPEED’s commitment is to ensure safety and to provide high quality products, hence the shock stroke movement has been tested 10 million times on advanced testing equipment; this amount of testing is equal to a vehicle with 5-years of mileage. 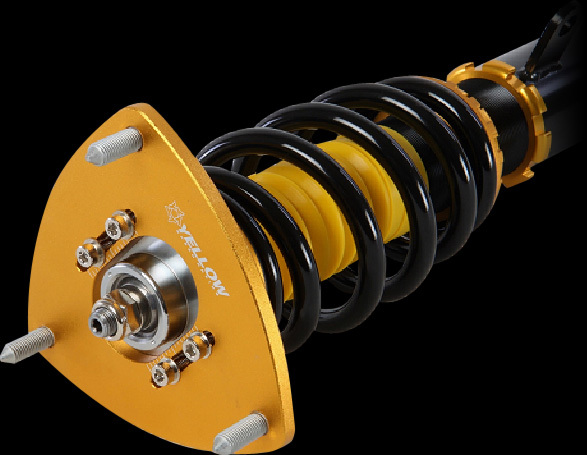 Each component of the suspension system is rigorously inspected and strictly tested by YELLOWSPEED to avoid any failure. Our commitment to continual driving improvement goes beyond words. All springs are produced from high quality SAE9254 steel for optimal durability and high tensile strength. The spring rate and shape remains unchanged and undeformed, even if the spring has been subjected to long term wear. A steel lower bracket is utilized for MacPherson strut type to increase rigidity for safety (where applicable). For some MacPherson strut models, the brake line bracket is welded manually perfectly to the steel lower mount. A high quality forged alloy aluminum lower bracket is used for Double-A Arm strut type (where applicable). The steel/aluminum lower bracket is processed with electroplated/ anodized surface treatment to prevent corrosion or rust in the harsh conditions of motorsport. The vehicle ride height can be adjusted easily with the lower bracket by winding up and down to drop and raise. 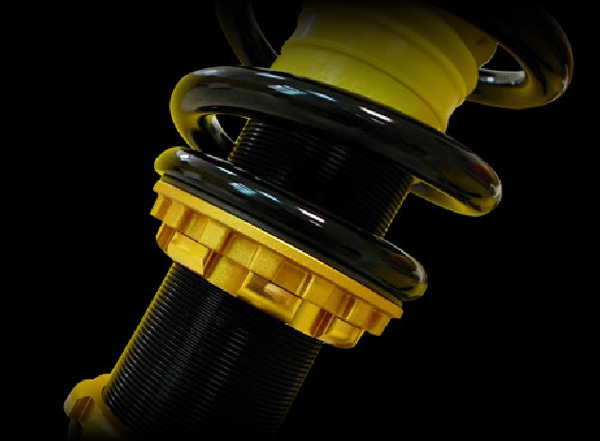 With the lower bracket, it allows maximum suspension travel without affecting the shock stroke.